All link placements are not equal. Get the most out of your on-page links with these tips! Can you tell me which kind of links I should be concentrating on and where exactly on the page or site I should be placing these links? I understand that I want links from relevant pages but is there a specific kind of link on which I should focus? I want to give my clients the best bang for their buck in link placements. Answer: On-page link placement is an often overlooked component of effective link building. You are correct in recognizing that not all links on a page are the same. Knowing the difference can most assuredly improve your fortunes and those of your clients. 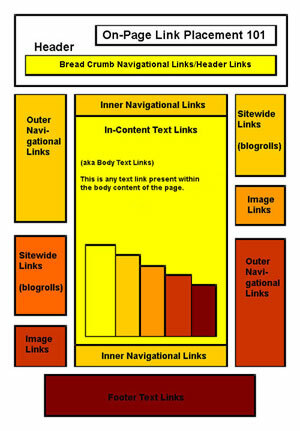 The power of a link on a page is really all about positioning and selectivity. In a nutshell, the higher on the page the link is placed, the more likely the link will pass authority. 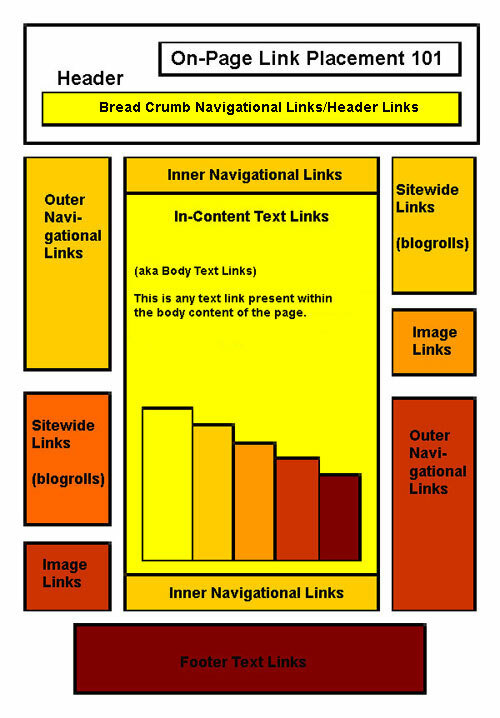 Header links will perform better than footer links due to their higher page positioning, while in-content links within the body of a page will perform significantly better than blogroll or sponsor sidebar links. Take a look at our over-generalized illustration of link placements to the right (click for larger image). The sweet spot for the most effective on-page links is pretty clear. You want a header or in-content body text placed link that is positioned highly on the page. In fact, the most ideal link you want to target would be an in-content link placed in the body text of the page, positioned as closely to the top header of the page as possible.